Although not originally local to the area, Albert Abraham Beach settled here after the war and went on to become Mayor of Wolverhampton. Albert Beach was born in 1886 in Yorkley, Gloucestershire, the son of James and Alice Beach (formerly Adams). According to the 1911 census he was involved in colliery stonework, and he moved to South Wales at the age of 17. He became interested in the Salvation Army, eventually training as a officer. As an officer he moved to the East End of London and later to Northumberland. He married Hilda Evelyn Ripley in Newcastle-upon-Tyne in 1908, and they had two sons, James Albert and Claude Ripley. 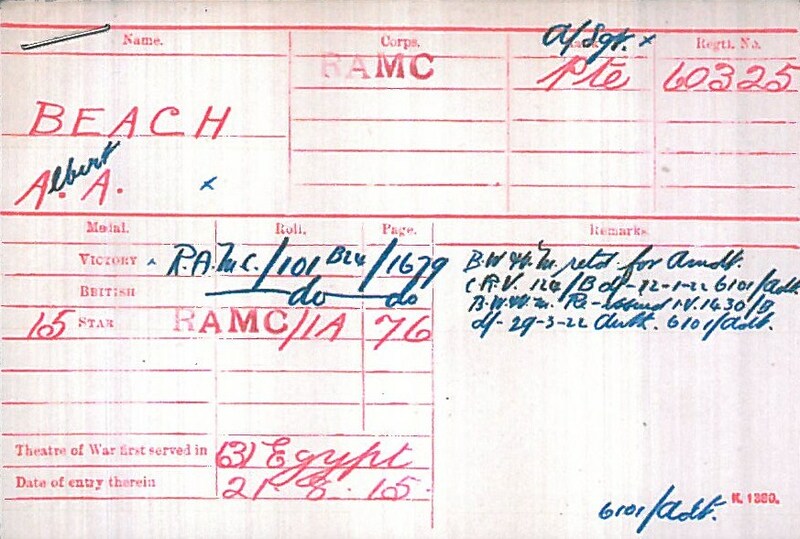 Albert Beach served in the Royal Army Medical Corps, Regiment Number 60325, first serving in Egypt from August 1915 onwards. His medal card is available to view at the National Archives. 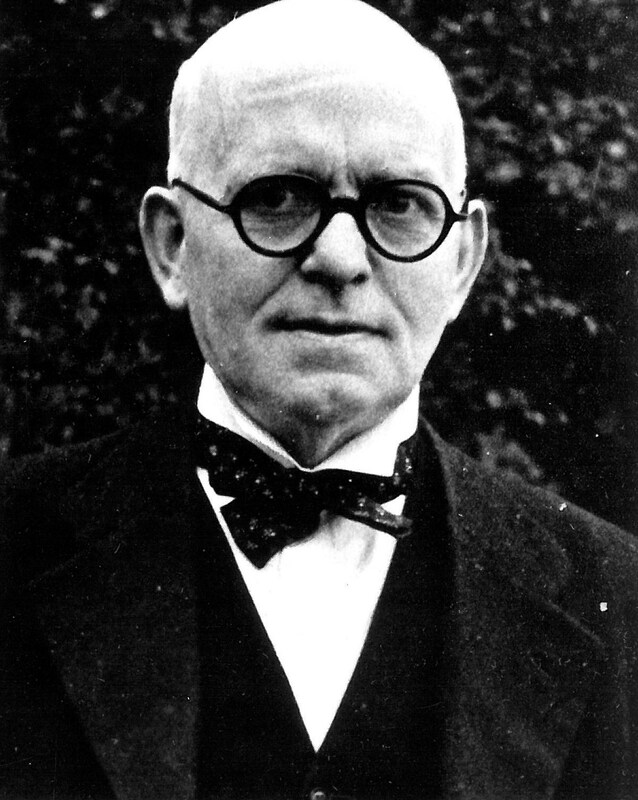 He was first elected to Wolverhampton Council in 1921. He held the office of Mayor in 1940 and upon retiring in 1941, he became a magistrate. On 27 June 1962 Beach died at the age of 76 in New Cross Hospital, leaving a probate amounting to £1997. The research for this blog has been completed by volunteer Gladys Roberts. Despite being a large and thriving company, Joseph Sankey & Sons Ltd was not immune from being affected by the First World War. Not least because the firm lost large numbers of workers to the armed forces. Combined with this loss, the company also had an increase in orders, particularly from the Ministry of Munitions, with the works at Albert Street and Hadley Castle producing field kitchens, mine hemispheres, aeroplane parts and bombs, rifle grenades, mortar bombs anti-submarine bodies and shell bodies. 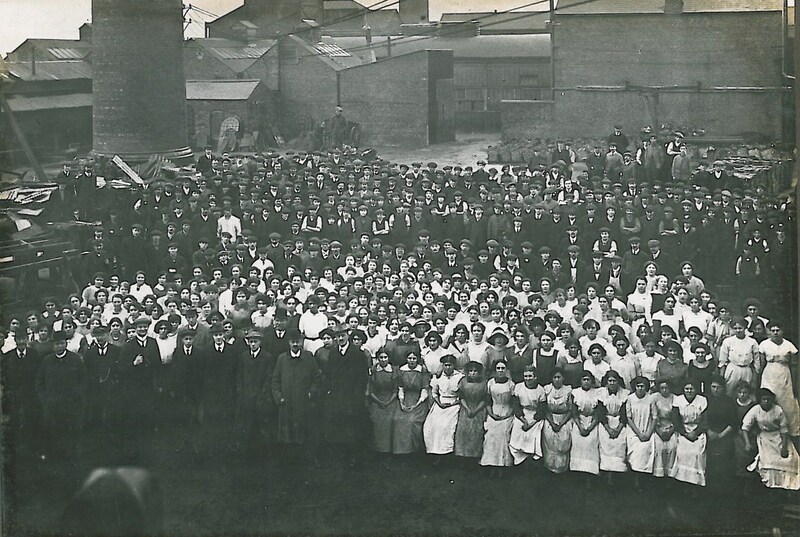 This photograph demonstrates the large proportion of female workers that were taken on during the war years, to cope with the increased demand. Sankey’s most important role during the First World War, however, was that of producing steel helmets. When the war broke out in 1914, soldiers did not have any protective headgear, and were just issued with a cloth cap. Steel companies in Sheffield apparently insisted to the War Office that it would be impossible to produce a steel helment strong enough to withstand a revolver bullet at close range. However, George Sankey, whose nephew Sydney was killed at the Battle of Loos in 1915 and whose eldest son Harold was in the trenches, refused to give up. Eventually the company managed to produce a strong manganese steel helmet. Sankey’s spent the rest of the war supplying 5 and a half million of these helmets, which was almost the whole requirement of the British Army. Sankeys lost 69 employees during the First World War, including Director Sydney Sankey. Their details are on the Works War memorials, which are preserved at St Leonard’s Church, Bilston. This blog post has been written by one of our volunteers, Chris Irvine. If you have any stories of local ancestors who contributed to the First World War, please share them with us! My great grandfather, Harry Russelbury Wenlock was born in Wheaton Aston on 27th February 1873, the son of a farm labourer, William Wenlock and his wife Mary. 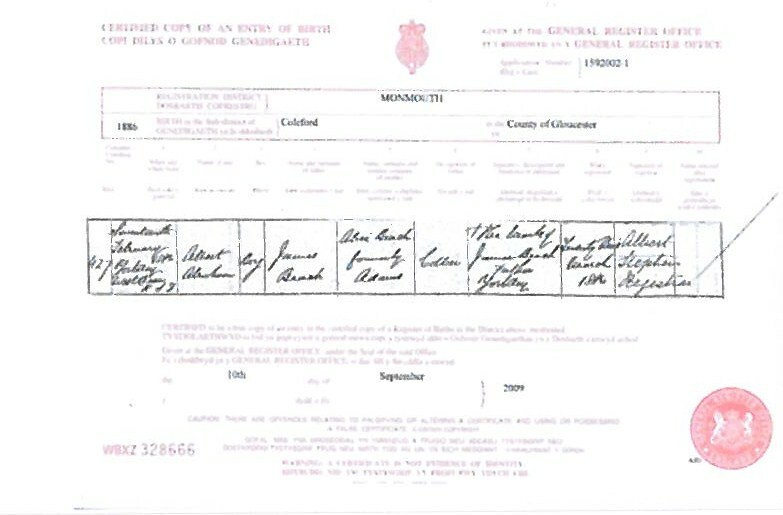 In 1891 he was a farm servant at Kidmore Villa Farm and two years later in October 1893 he married Emma Teresa Blakemore at St Mary’s Roman Catholic Church in Brewood and was working as a carter. During this period of his life he was in trouble with the law on a number of occasions for poaching and trespass. It is perhaps no coincidence that each of his six convictions for offenses of this kind were during the winter months when work would have been scarce. Court records note that he could only read and write ‘imperfectly’. At some time between 1898 and 1901 the family moved to Heath Town, Wolverhampton and Harry found work as a coal miner. Family testimony from one of his daughters stated that he missed the country life and often went back to the Wheaton Aston area to help with the harvest. It must also have been between 1901 and 1914 that he first joined the army. He rose to become a sergeant in the 2nd Battalion of the South Staffs Regiment and his army number was 10485. This may account for his non-inclusion in the family’s census entry for 1911 by when the family were living in Old Heath. In any event Harry had left the army by the time war broke out in 1914 and was working as a mine overseer, quite likely at one of the gin pits off Deans Road. He was by then 41 years of age and his eldest son, also called Harry Russelbury (or Russelberry on some sources) was in the army as were his nephews William Wenlock and Joseph Blakemore, whilst another son, Francis (Frank) also joined up. Family sources state that Harry was not prepared to stay at home whilst his sons fought in the war and as reservist in the South Staffordshire regiment he quickly re-enlisted despite his wife’s pleading that he should not go as he was ‘too old’. In February 1915 eight new Tunnelling Companies were formed as part of the Royal Engineers, including the 170th Tunnelling Company which made up of men from a nucleus of civilian sewer workers from Manchester reinforced by men from other regiments, including the South Staffs, who had particular expertise in mining or tunnelling. As an experienced soldier and a mine overseer Harry was readily signed up for the 170th Tunnelling Company, despite his age. These new companies were urgently needed and were sent almost immediately to Givenchy in France for operations to counter enemy activity. “For conspicuous gallantry and devotion to duty on the night of the 21st-22nd August, 1915, at Cuinchy, when he sank a shaft, 4 feet deep, in the No. 7th Mine, in 2 hours, knowing that the Germans were working within a few feet of him. Twelve men had already lost their lives at different times in the same mine only a few days previously. This account is borne out by a Company War Diary which recounts the Company’s exploits and tells the story of how a group of tunellers including Private Wenlock worked through the day and night of 21st and 22nd August in an attempt to tunnel beneath enemy lines and set explosions to blow up their trenches whilst the Germans worked only yards away on a similar attempt to blow up British positions. Harry Wenlock and his comrade Sapper J. W. Wood are each commended for their good work during this action and both were awarded a DCM. Harry was due to be presented with his medal by Wednesfield District Council but in fact was killed before this could happen and the medal was sent to his widow. After the incident on 21st and 22nd August Harry and the Company continued to see action and in September 1915 blew up two mines at the Hohenzollern Redoubt at the opening of the Battle of Loos. Harry was promoted to 2nd Corporal and a family story relates how he became a victim of a poison gas attack in May 1916 when he insisted on making sure that men working with him were evacuated from the tunnel they were working in before he himself would come out. He was transferred to a Field Casualty Station and died of gas poisoning on Sunday 22nd May. He is buried at Noeux-Les-Mines Communal Cemetery, Pas de Calais, France, 6 kilometres south of Bethune and near where he say action and subsequently died. The Express and Star reported that DCM Sergeant (sic) Wenlock was “a credit to his Country and died a hero”. His widow, Emma Theresa Wenlock also lost her son Francis in February 1917, who was a driver with the Royal Field Artillery and died in Mesopotamia, being commemorated on the Basra Wall and her nephews William Wenlock and Joseph Blakemore. Joseph is buried in Heath Town Churchyard and family stories state that Emma had his body returned from Ireland where he served at the Athone Garrison. All four are commemorated on the Heath Town War Memorial and on the lichgate at Holy Trinity Church, Heath Town whilst Joseph also has a serving soldier gravestone. Emma and Harry’s eldest son, also called Harry Russelbury survived the war and is my grandfather. His eldest son was also called Harry and my father was his second son and was named Francis Joseph. Emma also had five daughters, Elsie, Phyllis, Doris, Beatrice and Hilda (Lil). Some of the stories from the family were told me by my father and others by my Great Aunt Phyllis. As a child I met Emma Wenlock, my great grandmother who died in 1959 at the age of 90 also at Holy Trinity Churchyard in Heath Town although she remained a Catholic all her life and received a catholic burial service at Holy Trinity School, as she had requested. Harry Russelbury DCM is also commemorated on her grave. She is said never to have recovered from her husband’s death and was often heard to say, when speaking of him “he was too old; he did not need to go”. The service he and his family gave to their country was rewarded with a medal and a hard life, only made easier after the Second World War with the advent of the Welfare State. The medal was sold in about 1978 and if anyone knows its whereabouts or comes across it I would be most interested. 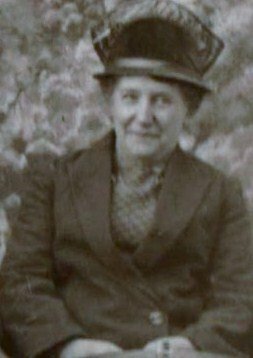 I attach a photo of Emma Wenlock but have no photograph of Harry Russelbury Wenlock and again if anyone has a photograph or more information please let me know. Sometimes the perils of the war came much closer to home. On the night of 31st January/1st February 1916, nine airships of the the Imperial German Navy, set out to bomb targets in the Midlands and south of England. One of these Zeppelins dropped some of its bombs on Bradley, Bilston, killing two people. In response, several measures were put in place to mitigate future disaster, including the installation of special telephone lines between the Chief Constable’s office and that of the electricity and gas supply stations. Arrangements were also made to contact the major works in the area who were likely to be operating after dark, such as Sunbeam, in the event of a further air craft raid. The same night, the Zeppelins also went on to bomb areas of Tipton, Wednesbury and Walsall. This proved to be one of the heaviest air raids during the First World War.